Are you depressed because your pet has been unhealthy for several days? Well, don't be, when National Pet Pharmacy is just one mouse click away. National Pet Pharmacy is one of the leading online pharmacies offering all kinds of pet supplies to all 50 states in the USA. This online pharmacy has supplies for a wide range of pets including dogs, cats, birds, wild birds, fish, horses and other small pets. National Pet Pharmacy possesses a huge assortment of items including Advantage, Capstar, Frontline Plus, Frontline Top Spot, HeartGard, Interceptor, K9 Advantix, Program, Revolution and Sentinel. National Pet Pharmacy is committed to eliminating various pet conditions be it arthritis, pain, ear or eye problems, fleas and ticks, gastrointestinal disorders, heartworm and other such diseases. You'll find solutions such as antibiotics and skin or coat vitamins to keep your pet healthy. The store was opened with a mission to take care of your pet's health with the best doctors and supply top notch product quality throughout the U.S. The online ordering process at National Pet Pharmacy is simple too! You can shop here anytime, as the website is accessible 24 hours a day. You can either shop according to your prescription or even without a prescription at National Pet Pharmacy. Search the products by ailment, body part or by letters in the search engine option depending upon your choice. For your prescription order, simply click the medication option of your choice in the Pharmacy Department. There you have to submit an online form at the time of checkout, providing some simple details. The pharmacy will call your pet's veterinarian to clarify that the prescription scripts are completed quickly for faster delivery. National Pet Pharmacy considers the price of each item an important factor and reduces it as much as possible. Some other featured products include IAMS Veterinary Formulas, IVD, Purina Veterinary Diets, Royal Canin, Fluoxetine (Generic to Prozac), Novox (Generic to Rimadyl), Temaril-P, Vetsulin, Baytril, Joint Oats 4 Dogs Dietary Joint Supplement, Grizzly Salmon Oil for Dogs and lots more. National Pet Pharmacy recommends having a look at its Pet Supplies Department and Wellness Department for various special items displayed on sale. For maximum savings, you must be a regular visitor of the overstock, clearance or sales department featured on the website. Your personal satisfaction has always been the first and foremost concern of National Pet Pharmacy. And so it is committed to offering prompt delivery of high quality products and services at an extremely low price. 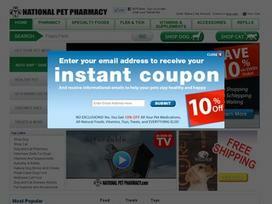 National Pet Pharmacy gives a 100-percent guarantee on each of your orders and ships them with care. Share what you think about National Pet Pharmacy, and your favorite ways to save there!